An amazing feat, director J.J. Abrams was able to converge the old with the new when it came to creating the look of his anticipated sequel Star Wars: The Force Awakens. Longtime fans were able to revisit landscapes and characters that were quite familiar, while a whole universe of new ships and aliens were introduced. But how did it come together so seamlessly? The new book The Art of Star Wars: The Force Awakens takes fans on that long journey, from creation and concept, to design and completion. Today, we have a number of images to share with you from this tome, which arrived in stores the same day Star Wars: The Force Awakens was released in theaters. Its visual design has always made Star Wars stand out in the sci-fi genre. And that tradition continues with this latest entry. The Force Awakens takes place 32 years after Star Wars: Episode VI - Return of the Jedi. And the movie contains quite a few relics from that bygone era. But as time progressed, and various civilizations evolved, we also get to see some of the technical advances that have happened since we last visited with our heroes and villains in this galaxy far, far away. The movie opens on the desert planet of Jakku, and right away, we see a landscape littered with crashed Star Destroyers and X-Wings. The galactic civil war has left a lot of ruin. And that makes for a fun sandbox in which these characters get to play in. The Art of Star Wars: The Force Awakens explores the creation of new starships, creatures and characters. The movie went through a very lengthy development process, and now we get to delve into some of the behind-the-scenes aspects that make this an instant classic. The art first appeared on Buzzfeed, and as we showed you early, they provide a look at BB-8 in his earliest stages of birth. But that's not all we get to see, as the rest of these images tease a book ripe with astounding sights to behold. Here, we get to see some of the different costume designs for Rey, who was named Kira at one point in the incubation stage. We also get to see concept art for some of the major scenes, and the landscapes utilized. There are a few Millennium Falcon paintings that are breathtaking, and actually fall in line with what we saw in the finished movie. We also get to see Rey exploring the ruins of a Star Destroyer. Christian Alzmann, Yanick Dusseault, James Clyne, Glyn Dillon, Doug Chiang, Ryan Church, and Iain McCaig are all created as artists on this catalogue of work. Throughout the book, these concept artists share their progress and process, and reveal how some of the images came to fruition. You may have noticed a striking similarity between Nazi symbolism and the First Order. This was all deliberate. Explains Yanick Dusseault,. The images show off how Daisy Ridley's wardrobe changed as Rey gets a short black vest and scarf which transition into the tan desert robes she sports in the movie. Some of the early design concepts didn't change too drastically from the art stage to the movie, such as Han Solo's costume. Early on, Glyn Dillon says director J.J. Abrams wanted to have Han in his New Hope vest. But they eventually came to an agreement that the brown jacket he wears in the movie fit the age of the character more appropriately. All of the concept and design art that is displayed in The Art of Star Wars: The Force Awakens was assembled by Phil Szostak. He worked on Star Wars: The Force Awakens as a a conceptual researcher and archivist from the start of development in December 2012. And was a fixture in the art department all the way through the end of production. 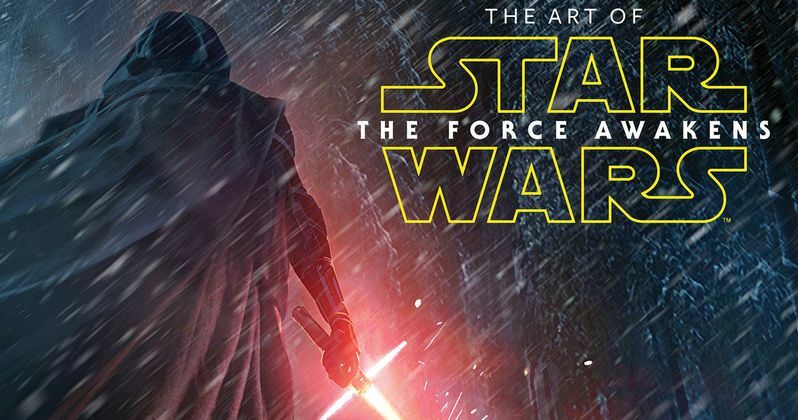 To see more, you can check out The Art of Star Wars: The Force Awakens available now from Abrams books.